The following history of Sigginstown Castle, in Tacumshane, County Wexford comes from our research over the past three years. We have used available information, and have not yet delved into the Wexford county archives or library (on our list to do). Like any research, it depends heavily on a number of sources, published in original texts, republished in books, and then on the Internet. As such, we cannot vouch for the accuracy - we would be happier to authenticate every "fact" by seeing it in a historical document, but we are not to that point yet. Since buying the castle, we have abandoned our own family genealogy research to pick up the trail of Sigginstown Castle and the many people who have touched it with their lives. Any readers who have additional or more accurate information are most welcome to contribute it, along with old photos, drawings, folklore or family stories. Some of our recent research is prompted by a desire to represent the history of the castle with a flag. 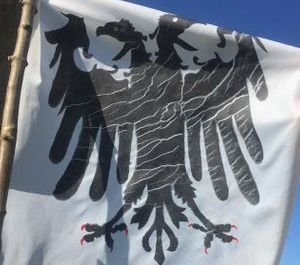 There is heraldry associated with: Siggeston, Segheston, Siggstone, Sigheston: "Argent, an eagle displayed double headed sable armed gules"
It not known exactly when or where the Siggins came who settled in Ireland, and when they turned up in Tacumshane. They are not listed in documents as holding original land grants or knight's fees after the Norman-English invasion. Therefore we have been searching for other medieval references in England and Wales to find their possible origins. Since the name may indeed by Norse, we could be on the wrong track, and eventually find they settled directly from Norway or perhaps Normandy! For now we follow the suggested trails left by other people like Billy Colfer and Herbert Hore who had a deep history and experience with the local history. Herbert Hore writes that In 1342 (Memoranda Rolls, 16 Edw. III) Thomas Syggen, David fitz David, Nicholas fitz Gerald de Rupe (Roche), and Adam Avereys were the sureties for Richard Whitty, formerly sheriff of the County, who were called on to produce him before the Barons of the Exchequer at Dublin, to render an account of his office. Mem. Rolls, 1368, mentions Roesia Sygyn, wife of John Hay. They were the sureties for Symon Neville, fined for contempt. The fields around Sigginstown are now known to be in use before the tower is built and through recent archeology we have found medieval remains and ditches which relate possibly to the 14th century. These are currently being dated and conserved. Certainly it is likely there was human habitation there well before the tower, and possibly pre-dating the Siggins family also. 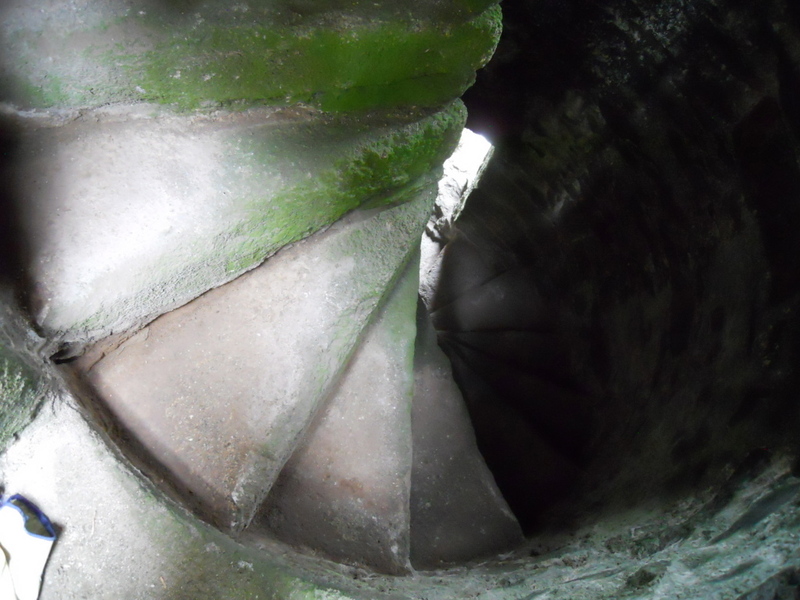 The tower seems to date from early 1500s - we have selected 1520 as a nominal date. This is from the possible late 15th century to early 17th century dates provided by carbon dating the gorse wicker framework in the tower. When the tower is built by the Siggins, there is probably an earlier hall house detached, as the current house is of later period, and there is no practical purpose to attaching it to a defended tower. Another Thomas Siggins lives (? -1596), then Mathew Siggins holds Ecclestown, Sigginstown, Corbally (Sigginshaggard) and marries Margaret Codd who is still living in 1633. Matthew Dies on December 24th 1629. Son (?) is Philip Siggins was ward of King aged 12, died between 1634/1641 with no issue. Richard Siggins? Inherits 120 acres at Sigginston including water mill. Marries Margaret Sinot, who survives and living in 1634, then Edward Siggins (<1641 - >1691) Inherited lands of brother Philip including 106 (Plantation) acres at Sigginstowne, 44 acres in Atlistowne & Rochland (now Ballyhiho townland), 24 plantation acres (Sigginshaggard? –townland of Martinstowne Parish of Ballibrennan). Edward is attainted of high treason after 1641 rebellion, transplanted to Mayo in 1654. He is given a grant of lands of in Balla parish. Edward files an unsuccessful suit in Chancery on June 11 1690 to reclaim Wexford estates stating his long lineage, loyalty to the English, Norman blood, and their refraining from intermarrying with “mere Irish”. Edward’s son settles in Sligo. The Down Survey, published online, does not have the most detailed maps of Tacumshane, like other parishes of the time. However, it does show on plot 10 a tower, unattached house, and a mill nearby. The Down Survey was done after the time of Cromwell and documents the previous owners and land boundaries, plus the new owners post-Cromwell. From this we learn that the new owner of Sigginstown was a William Jacob, a lieutenant in the Army, and Edward Siggins' other lands in Ballyhiho go to a Hugh Hobb. 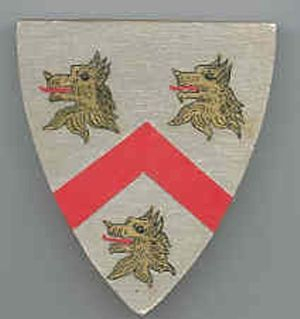 The Jacobs heraldry is well documented: Argent, a chevron gules between three wolfs heads erased (Horseheath branch). For the continued history of Sigginstown Castle through our heraldry project, we chose this device to indicate the Jacob phase, and their motto, "Tantum in Superbos" "Only the "Proud". Much information on Jacobs is from “An Historical & Genealogical Narrative of the Families of Jacob (1875)” sent by Nicholas Jacob in France. Another excellent source is MyJacobFamily.com website by Kenneth Jacobs in England, and this image is from his collection. William Jacob (circa 1610-1688), was a lieutenant in Cromwell’s army. 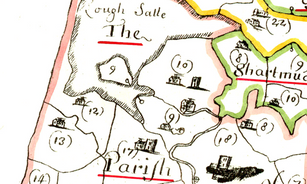 The lands of Sigginstown are granted to him on 22nd of June 1667, in consideration of his military service. This property consisted of ‘533 acres 2 roods and 28 perches plantation measure, or 864 acres 1 rood and 34 perches statute measure. Twenty-eight other soldiers sold William Jacob lands in return for small amounts of cash, and they seemed to return to England. He was claimant for other lands in the neighborhood but withdrew petition and they were regranted to original holder (?). From the Down Survey data, in 1671 William Jacob has about 561 acres, gaining lands from many other owners aside from the Siggins. He gets a large area of land in Tacumshane: 151 acres in Cumshintown, Bennetstown, Muckstown, Hardyglass from Nicholas French, 108 acres in Ring and Ratholan from Nicholas Stafford, 73 in Walshestown from Jasper Codd, and 60 in Churchtown from John Hay. He also has 44 acres in Muckrath, Killinick from Philip Lambert. Since Edward Siggins is attainted of treason in 1641, transplanted in 1654 and William Jacob gets it in 1667, this raises the interested question of what was happening to the property during this 13 year period? Did the Siggins family continue to live there or is it vacant? It would be useful to get information about other great houses and castles and how they fared in this time of great upset. William married Miss Austen of Horsemonden parish, Kent. He died in either 1668 or 1688 (The Jacobs family history has both dates, one in error). William had two sons, John and Austen (nothing is known about Austen). John Jacob (circa 1640 – 1711) is listed as the best gentry of the county, and on a special jury panel before 1677. He married and had six sons and two daughters. His family tree branched out into three different locations: Sigginstown, Rathdowney (Wexford) and Queens County. His 4th son is Richard Jacob of Ballyragget (we are interested in knowing whether this included the castle there). John died in 1711 and is buried in Tacumshane churchyard. John left everything to his second son Edward, as the first son, William, was disinherited. William was in Wexford town, held a lot of property but was attainted as a Protestant by Parliament of James II in 1689. He dies before his father, who references the trouble his son has given through this situation. Edward Jacob, Esq. (Dates unknown) inherited Wexford property, houses in Dublin (Henry, Liffey, New and Peter streets). An attorney, he married Sarah Knox on 3 Jan 1696 (daughter of Thomas Knox - Rathmacknee, Wexford). Rev. Ulysses Jacob (1727 – 29 Jan 1813) Entered Trinity College Dublin on the 30th of June 1750, graduated Spring 1755. He married 11 July 1750, Clarissa, daughter of Mr. Devereux of Kilrush, Wexford, and had two sons and two daughters. Ulysses was buried at Johnstown, next to his mother’s tomb, ‘ Contiguous to this tomb is interred the body of the late Ulysses Jacob’ . The Wexford Herald on January 30, 1813 published, 'On Saturday, at Sigginstown, in the 86th year of his age, the Reverend Ulysses Jacob, one of the oldest Magistrates of the County'. The property devolved upon one of Ulysses sons, either John or Richard who seems to have been "weak-minded' and was cared for by one of his sisters, either Mary or Jane. This woman married a farmer named Michael Wilson. An 1811 map published by Valentine Gill shows people connected with the 1798 rebellion. A Mr. Willson is shown associated with Syganstown. If Michael Wilson was in the Rebellion of 1798, did this somehow contribute to the decline of Sigginstown Castle and led to it's ruined state? More research is needed, but this starts the Wilson phase of the castle. Mary Jacob (dates unknown) probably married Michael, was eventually in possession of Sigginstown, and left it to her son John Wilson. 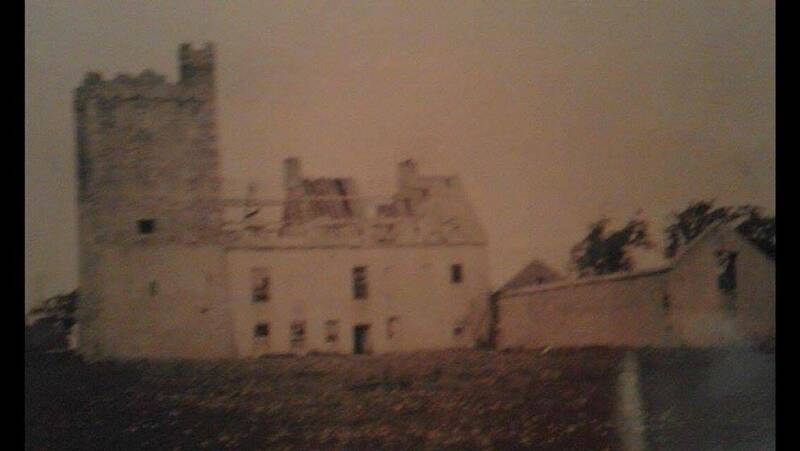 The Jacobs book in 1875 says he 'alienated most of the property, and now lives (maybe up to his death in 1869) in the half-ruined house, adjoining the old tower of Sigginstown Castle.' If this is true, then the house was well into decline 75 years after the rebellion. This coincides with research assisted by the Wexford Library staff who confirm that by 1853 John Wilson had sold 2/3 of the land, with a further sale in 1880. 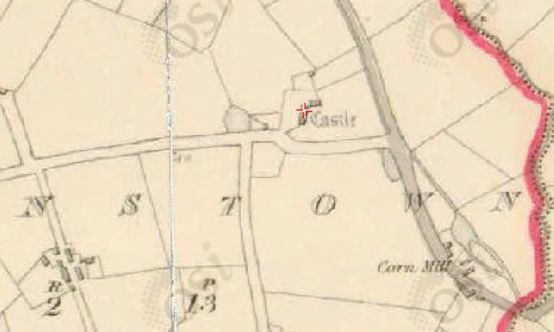 From “Treasures of Tacumshane” there is reference in the early 19th century a family by the name of Heron were said to have lived at the castle. Apparently they had five children, all of whom died very young. (We have found no record yet of this family, and would be interested to hear of any documents). In 1840 for the OSI survey the castle was described as being in good preservation, measuring on the water side 25 feet by 23 feet, 7 inches, and about 50 feet high, and that it was much used as a store by a farmer whose house is built against it. From the 1853 Griffith’s Valuation record and Map: John Wilson listed in Sigginstown and owns most of the property including land across the street and Sigginstown Island. The Wilson lands included the corn mill marked on the original Down Survey map as part of the Siggins holdings. The mill was converted in the late 20th century and the mill works and water course are now gone. John Wilson (1794 - 1869) marries an Eliza, and they have four children: John, Elizabeth, James, and Frances Mary. It is unclear who the last resident of the actual castle is - John Wilson? Eliza his wife dies the same year. James (1840- 1910) inherits the property and married Fanny Furlong. In the 1901 Census James (61) and Fannie Wilson (54) are listed in House 7 with five children, Frances (22), John (19), Benjamin (17), Lizzie (14) and Katie (5). They are Roman Catholic. James dies on 30 December 1910 and his estate is valued at 226 pounds. In the later 1911 Census Fannie Wilson is in House 16, with daughters Frances (32), Lizzie (24), and Kate Mary (18). 'My grandmother, Mary Kate Wilson is not listed on the census report filed by her father, James Wilson, 1901. Mary Kate was the eldest of their six children. I don't know exactly why, but she lived in Tacumshane with her aunt, a sister of her mother, Fanny Furlong. You probably know that the Furlongs were a Catholic family, whereas the Wilsons, of course, were Church of Ireland. Of the six children, three married and had children. Mary Kate married my grandfather, Richard Pierce. My mother Sheila, was the third daughter of their eight children. Frances married James Murphy. They had two children. John died at an early age, probably TB, no children. Ben married, five children. My great-aunts Lizzie and Katie, continued living in the house near the castle where their parents had lived, and kept the farm going. Lizzie was a teacher in Tacumshane school - very strict! When we visited Ireland, my mother would do the rounds visiting all the family ...aunts, uncles, cousins, so we knew them all. Richard Pierce, who sold the castle, is my first cousin ...son of James Pierce, my mother's youngest brother'. The old postcard shows the castle in a ruined state circa 1909. 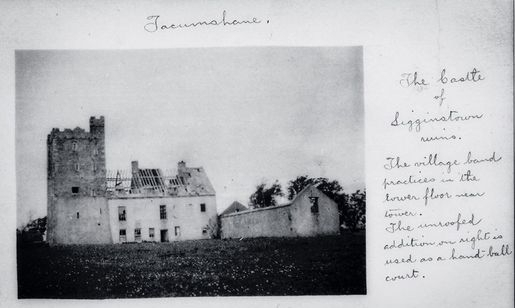 It was taken by Benjamin Browne who had lived in Tacumshane, emigrated to Philadelphia, PA and returned to photograph the area and his relatives. In this rather long history of several hundred years and many families, we come to the present day. Our purchase of the castle in 2016 now becomes a single event and small period of this building's long life. We hope to make it habitable and use it to hold some heritage and living history events. We will continue to research the people and events of this fascinating and ancient place. We are grateful to the many local people who have helped us thus far, and to the far-flung descendants of the Siggins, Jacobs and Wilsons who send in precious bits of information.